Summary: The beloved 1964 musical about an early 20th Century Jewish family forced to leave their Russian home, performed in Yiddish. 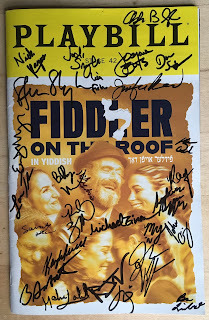 Highlights: I've seen Fiddler several times before, but not like this. I've never felt so moved, several times to tears, witnessing this epic, iconic, and common Jewish story. The Yiddish language makes the story feel that much more authentic and real. Althought my German minor helped with the understanding of the language, it's certainly not necessary to know a word of Yiddish or German or Hebrew; English translations are displayed on both sides of the stage and you soon get used to glancing at the text while absorbing the emotion of the spoken words. Joel Gray directs a marvelous cast, with the best Tevye I've ever seen - Steven Skybell. He absolutely ripped my heart out in his emotional portrayal of this strict but loving father, wrestling with his traditions and his God. The entire cast is great, with a special shout out to TV's Jackie Hoffman as the hilariously dry Yente. 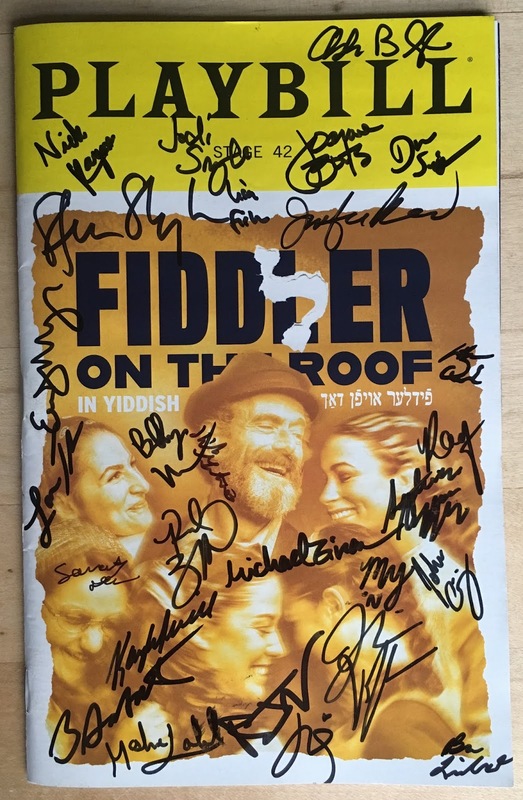 Fiddler is a three-hour long musical and often it feels like it, but not this production. Joel Grey keeps the momentum of the story movement with not a slow or dull moment. Jerome Robbins' original choreography is thrilling, with delicious tension as the audience awaits the iconic bottle dance we know is coming. This familiar beloved score sounds gorgeous thanks to the lovely onstage band (and featured onstage clarinetist!) and this large and talented cast. It feels like now is an important time to tell this story and continue the tradition of Yiddish theater, with the recent rise of anti-Semitism. So many Anatevkes lost, so many traditions lost, so many lives lost. Telling this story in the language of the original source material is a way to keep it alive. This is Fiddler like it was always meant to be. *Once again, I'm using an abbreviated Fringe-style summary for my NYC 2019 trip, since I am in the greatest city in the world with much more exciting things to do than write! Click here to see all of my Broadway-related blog posts.